Shall I say Happy Christmas? When is the right time to start saying happy Christmas? Anyway, I love that we are right in the hustle and bustle of the season. Everybody seems to be in a good mood and this is the perfect time to try a game I have been looking forward to doing with my students. I know I post about games quite a bit, but I really believe students learn better when they are having fun. Mark the word “learn” because playing without learning is a waste of time in my class. So, my students already know that after the game, there is going to be revising and reinforcing. If you have been kind enough to be reading this blog for a time, you probably know I love Ellen DeGeneres’s games and I am always looking for a way to adjust them to my own context of teaching. After watching her more appealing version, you’ll read my own version. More humble and less visually appealing, but hey, we are trying to learn English here, aren’t we? I have designed two variations of the game. One is funnier than the other. The funnier one requires more preparation but trust me when I say it pays off. 1. 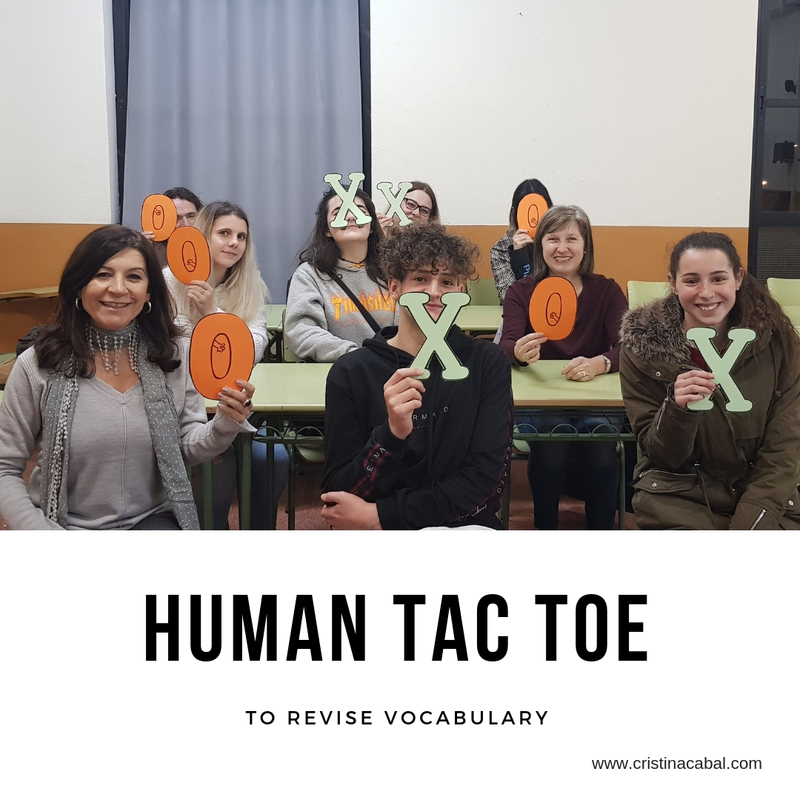 You will need to prepare a set of questions to revise the target vocabulary. What do you call the person who…? Fill in the gap in this sentence…. 2. In both versions, you’ll need to choose two students (student O and student X ) to play the game. Place a table at the front of the class and ask the two contestants to stand behind it facing the class. 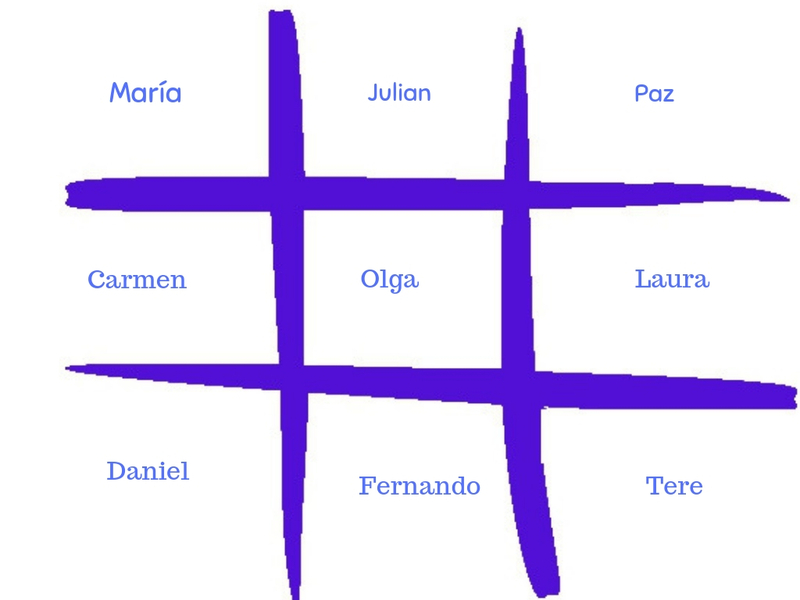 Students take turns marking the spaces in the 3×3 grid. The player who succeeds in placing three of their marks in a horizontal, vertical, or diagonal row wins the game. Toss a coin to decide who starts playing. Let’s say Student X starts playing. Student X chooses a student in the grid. Let’s say, Ana. Ask Ana a question from the ones you have previously prepared. If she answers correctly, she will hold the X, if she doesn’t answer correctly, then no letter will be displayed. The winner will be the student who succeeds in placing three of their marks in a horizontal, vertical, or diagonal row. Less funny version, but also fun. Choose the two students who are going to play the game. Toss a coin to decide who starts the game. Student X or O chooses a student from the grid. Tip: I have played the game twice. The first time I used the less funny version and then I went for the funnier one. The combination worked just awesome! 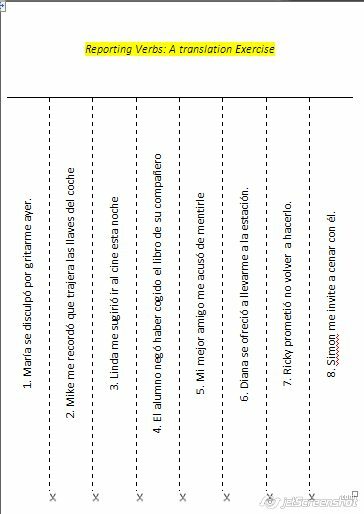 Do you like translation exercises? If you think they are boring, perhaps I might succeed in changing your mind once you read about this activity. Writing is always on my mind (like Joe Manganiello 😀 ). It ‘s true that I should probably dedicate more time to writing tasks in class, but writing takes a lot of time and time is a luxury I cannot always afford. For this reason, I try to do small writing activities that take less time but have proven very effective. If you have been reading my blog for some time you have probably guessed a thing or two about me: I am a huge fan of competitions and anything that brings fun and a relaxed atmosphere – and probably a little bit of noise- into the classroom. I think the exercise I’m about to describe combines perfectly well the two above. 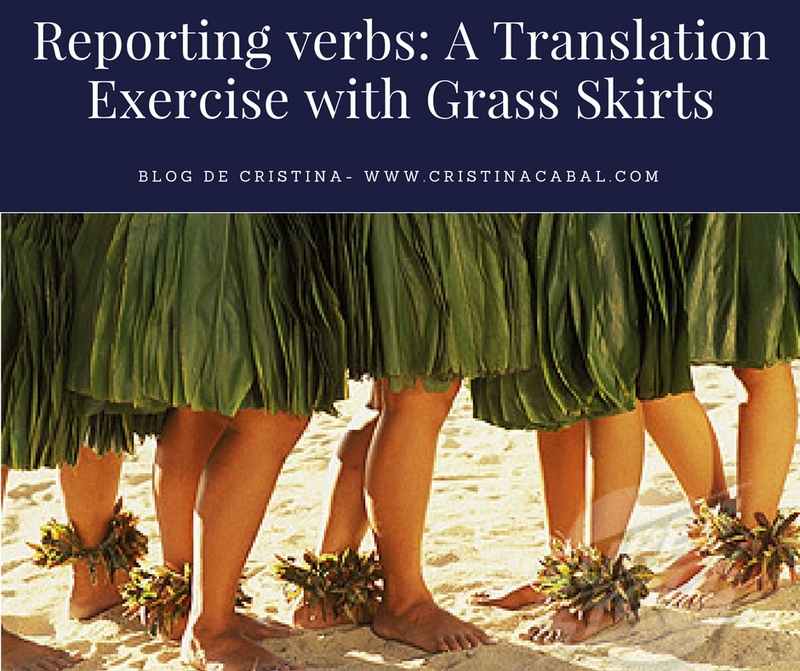 I have used it to revise reported speech (indirect speech) and more specifically reporting verbs, but it can be easily adapted to any other point of grammar you need to revise. In case you are wondering, below is a picture of the grass skirt I have used for this activity. You can also call them tearable sentences, but I like grass skirts better. You can make your own template o download the one Tekhnologic very kindly offers on his website. I have used his.